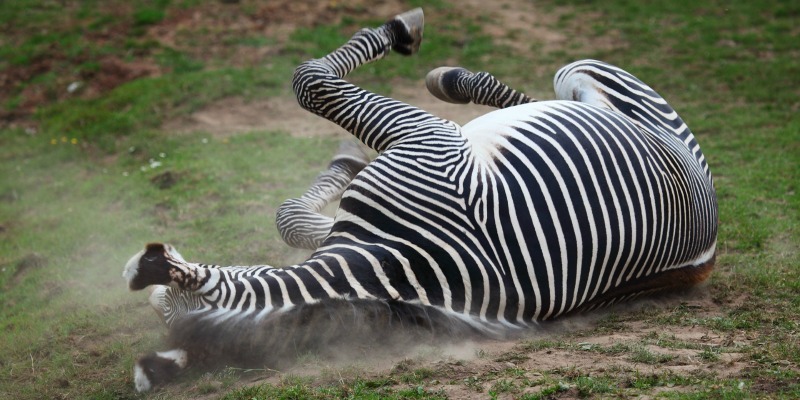 In this post we will look at the world of the zebra in the wild. how a stallion will choose his females and how they will mate as well as a few other zebra facts and trivia. We illustrate the facts with pictures and statistics wherever possible. 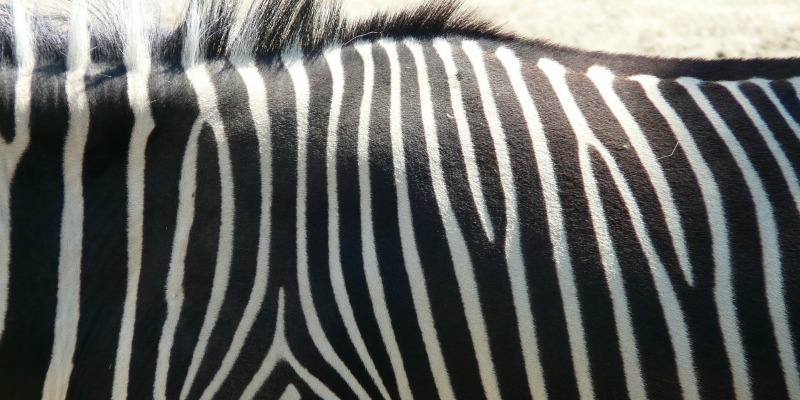 Nobody knows for sure why these African animals have stripes. The purpose of the stripes has stimulated a good deal of discussion amongst wildlife enthusiasts. Conceivably the stripes could act as camouflage. Predators without color vision find them difficult to isolate when they are bunched up in groups. This theory is supported by the fact that you will very seldom spot lone zebras by themselves. 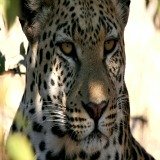 They are successfully hunted by lions, spotted hyenas, wild dogs, cheetah and leopards. This means that if there is a camouflage effect or a distortion of perspective it cannot be very effective. The problem with these theories is that their behavior does not fit what would be expected from a camouflaged animal. Firstly they prefer an open habitat with short grass making them conspicuous. In addition to this these African animals are quite noisy and active and they do not freeze in response to danger. An important pointer to the function of their stripes is their effect not on predators but on other zebras. It has been suggested that the stripes serve as visual cues and identification of each other. 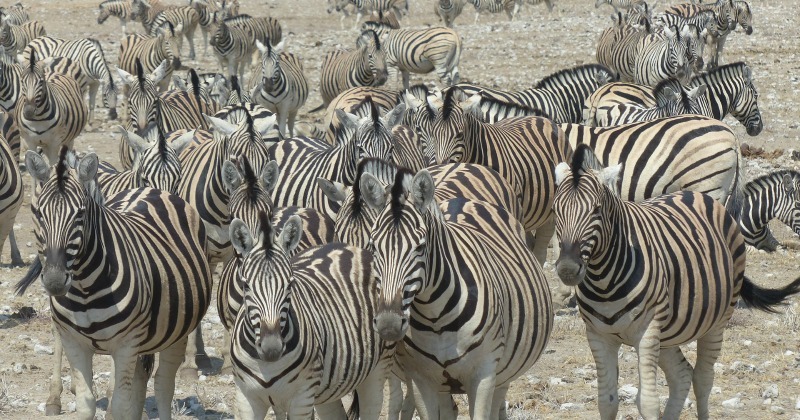 With each striping pattern unique to each individual, they can recognize one another by their stripes. Interestingly they seem to have some fascination with stripes. There are accounts that even black and white stripes painted on a flat surface will attract them in groups. 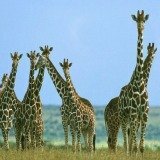 What habitat do these African wildlife animals prefer? The Burchell's zebra prefer open woodland, scrub and grassland. They will avoid dense vegetation. They are very dependent on water and you will seldom see them more than 12 km from it. The Cape mountain specie prefers the mountainous areas of the Eastern and Western Cape in Southern Africa. 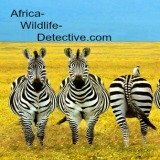 Is the zebra a social African animal? These African animals have a society that is based on small family groups of harems and bachelor herds. Stallions will fight viciously for control of the females. A dominant stallion controls a herd of up to 6 mares and their foals. The stallions active shepherding of unattached females forms these herds. The stallion heads the hierarchy, herding his harem with head held low and his ears laid back. Groups are bonded mutual grooming of the head, neck and shoulders by gently nibbling one another. When herd stallions meet they approach to within a few meters of each other. They will stand with their heads up and then slowly approach with their heads down and ears cocked. rub their heads on the partners rump. Males that do not hold breeding herds join up into bachelor herds. Bachelor males either live alone or with groups of other bachelors until they are old enough to challenge a breeding stallion. Young stallions can take over an established herd by defeating its controlling male. This however will require him to enter into a violent contest of kicking and biting. Stallions are unable to breed until they have gained control of a herd. Why is there a dominance hierarchy amongst the mares? There is a strict pecking order among the herd’s mares. This is established by fighting and maintained by threat gestures. The privileges of a being a high-ranking mare is that they get priority of access to dust baths, shade and other limited resources. 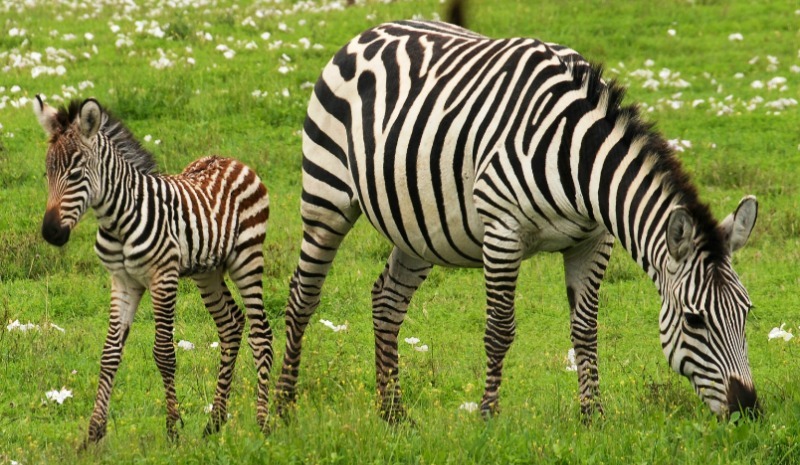 Did you know - the zebra is an odd-toed ungulate? They have hooves that feature an odd number of toes. Like most ungulates the eyes sits on the sides of its head. This gives these African animals a wide field of view to be on their guard against predators. Ungulate refers to any mammal with hooves. A hoof is an enlarged toenail. These hoofed animals walk on tiptoe. 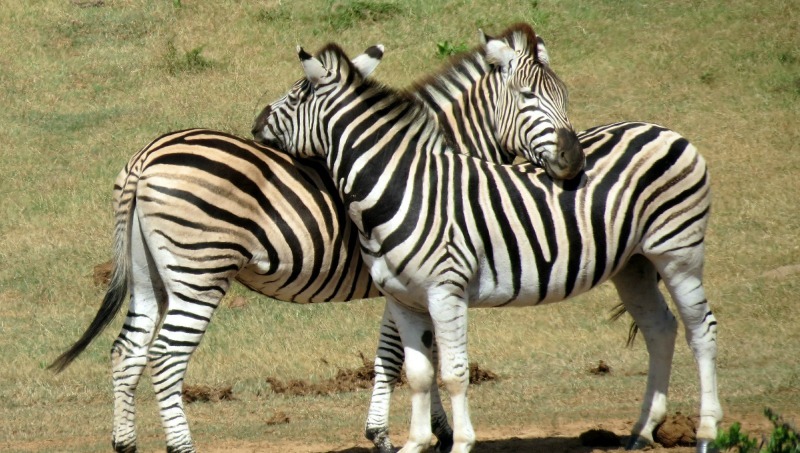 What enemies do zebras have and how do they defend themselves against predators? These African animals have excellent eyesight. Because they are ungulates their eyes sits on the sides of its head. Lion and spotted hyenas are their most significant predators. If attacked the herd will bunch flee together. In groups each individual has a smaller chance of falling prey. The stripe camouflage may also assist during the defense by confusing the predators and causing them to hesitate. The mare with the youngest foal being most likely runs first with the foals running alongside their mothers. The main herd stallion may on occasion ward off the attackers with a defensive rearguard position. From this position it will kick and bite any predator that comes within range. 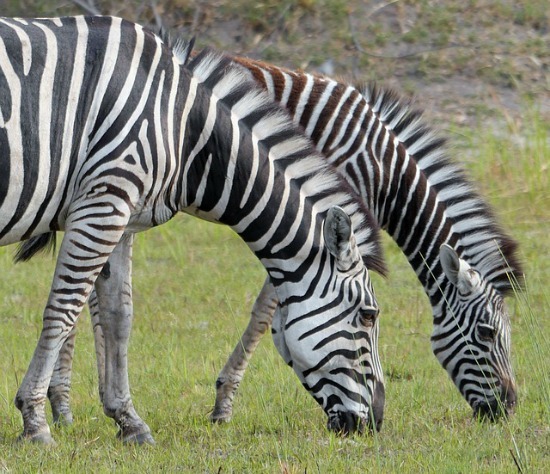 What predators prefer zebras in their diet? In the Kruger National Park they provide 16% of lion kills and in the Savuti 29%. In the dry season of the Savuti they provide 80% of spotted hyena kills. What do do they eat ? They prefer short, green grass but will also eat coarse tall forage. This is because their efficient digestive system allows them to live on diets of lower nutritional quality. 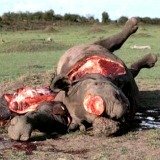 When they feed you will notice that while some animals have their heads down grazing others will be standing up and looking around for predators. A herd stallion checks the reproductive condition of his mares by sniffing of their urine. The mares urinate more frequently as they come into heat and the male marks where they urinate. This is probably done as a deterrent to competing suitors. When a mare is on heat the mare presents to the stallion by standing with her hind legs splayed and her tail lifted to one side. Mating takes only a few seconds and is repeated hourly for two days. A mare with a newborn foal is very aggressive towards her herd companions. A foal is able to run beside its mother within an hour of birth. A mare is extremely possessive and protective towards her own offspring and will spend a lot of time sniffing and licking it. Each mare recognizes her own foal by smell for the first few days, and then by sight by its stripe pattern. Foals eat grass after only three days but it is 11 months before they are weaned. Until they are about three and a half months old foals eat portions of the adults dung to pick up the bacteria they need to digest their food. Please share your feedback, favorite zebra facts and observations via the comments below.